In today’s volatile job market, it’s more important than ever to have an education. Skilled jobs are more secure, offer higher pay and usually come with better benefits. Thankfully, you don’t have to spend two to four years earning an associate's or bachelor’s degree to start such a career while at the same time accumulating student loan debt. With the right certificate program, you can be trained in as little as one month ! You will be recognized because you have nursing and medical skills and there is a job market out there that is only growing bigger each year and this is coming from the Labor Dept. and numerous newspaper and professional journal articles that continuously document this fact. Make money now !! OUR VETS ARE WORKING !!!!!! We are proud to announce that for over 25 years we have trained, graduated and helped place over 10,000 students. That’s a remarkable track recor and a testament to the dedication and high morale of our students and staff combined. FACT : MDs hire staff from a school that they trust !!!! Plus we’re a fraction of the price….with time payments too. Why put yourself in debt with student loans for years. Special Notice: Personal Training Loans are available if you want to go that way. You can fill out the application at the office and fax it in. We’ll help if you run into trouble with it. Good thing about those loans is, you can make a course like this affordable and then some. They have great repayment terms and give you years to pay off the loan at a fair interest rate. So if you can afford a minimal repayment per month of around $125, you can take this class. Approximately 80% plus of our graduate Full Medical Assistants have been placed by the school to date. The passing rate of our last National Competency Exam was 100%. Can you imagine what it means to be able to accomplish such an awesome goal of enrolling in, graduating from and passing the national certification exam, all in under six months ? Basically a fraction of the time and a fraction of the price of more costly schools, with the same end result. CNAs in New York earn an average of $35,000 to $40,000 (about $800/per wk) wages have been shooting up and some new CNAs start at close to $19/hr, Plus your fair share of overtime and double shifts, with benefits and your fair share of holiday time too. Being that this is a nice salary for an entry level medical position, it is recommended for those that would like to work in the medical field but do not want to do four or more years of nursing education at a university. 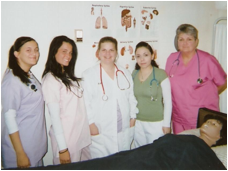 In order to work as a CNA you must be certified. 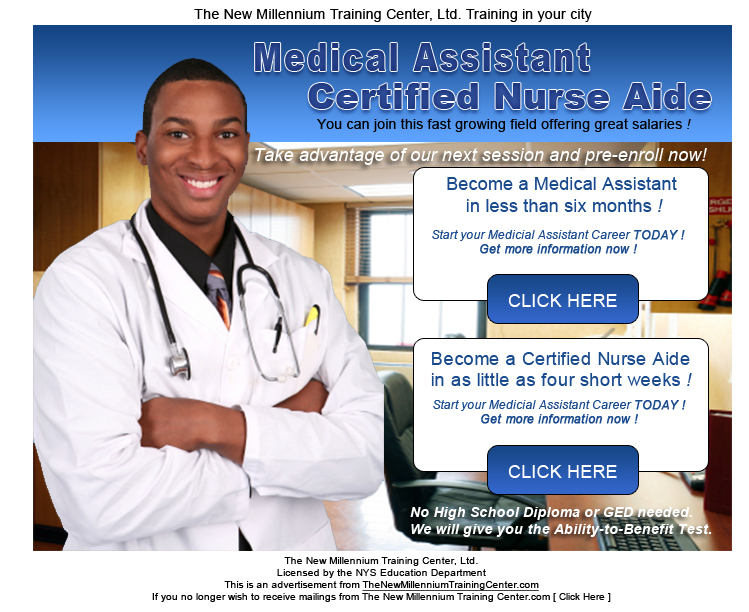 To become certified, the first step is to enroll to take the CNA classes. Register in enough time to get your seat. First come first served. Voucher students need time to be processed. Don’t delay. Career Advisers, Case Workers, Counselors, and others are asked to please process their potential students with enough time so as not to let the student’s window of opportunity pass and they’ll have to wait another month before they can start their training….PLEASE …. The New Millennium Training Center has assisted well over 250 students and graduates last year, with resume preparation and job searches. We are very proud of our efforts and of the positive outcomes, as well. The number of agencies that have referred students to our school have been able to share in our success by sharing those positive outcomes. Placement Activity is pretty high these days, especially with CNAs. The Health Care industry is perhaps the largest employer on Staten Island or even in all of New York City, for that matter. There are literally thousands of healthcare jobs available 24/7. In Staten Island Hospital alone, there are over 6500 hundred people working there daily. So it goes in healthcare facilities, large and small all throughout the metropolitan area. Did you know that in Brooklyn alone, there are well over 400 facilities, three shifts per day ? There are always people on leave, retiring, maternity, workers comp, disability, etc. Part Time of Full Time....... jobs are available. The New Millennium has been responsible for literally thousands of people now working and that's a fact !! You could speak to hundreds of facilitiies that have hired our graduates and thousands of those graduates themselves. We are a T E A M.
We are well Trained...well Versed in our skills....well respected by the Healthcare Facilities and graduates can get their jobs on their own if the choose…..but if someone needs a little helping hand to get a foot in the door....we’re just a phone call away. Most of the time we can help place you almost immediately. 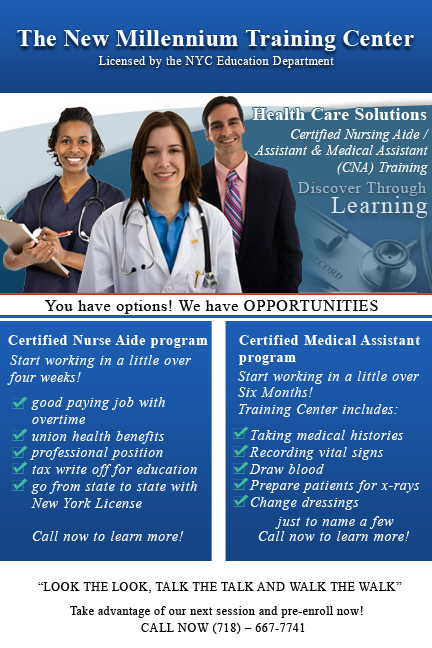 Within the previous years the number of facilities in the NYC metro area that have contacted us to send them new CNA's has increased tremendously. Our training is just plain good and our students get plenty of hands on training so they know what to do on the job the very first day and the healthcare facilities really appreciate that they do. NYSDOH State Board Exams can be scheduled and taken within days of the class ending. You get your results sent to your house in 5 working days..possibly sooner on line...... Nobody helps you do it faster than we do !!!! For any colds..I take about 6,000 mg of Vit C (plenty of water) and 200mg of Zinc along with the Simply Saline nasal spray to kill the cold virus. It works every time in about a day. visited the many farmers to see if he could help them combat the flu. work.. Try it and see what happens. We did it last year and we never got the flu. just like that.. the onion was a mess and I began to feel better. Lots of times when we have stomach problems we don't know what to blame. after it has been cut open. Mullins family. My friend, Jeanne, is the CEO. chemistry expert and is involved in developing most of the sauce formula. He's even developed sauce formula for McDonald's. that all commercially- made Mayo is completely safe. As we grow older we get into the habit of reducing the amount of fluid intake each day and it becomes cummulative and then the body learns to adapt to and run on whatever our intake levels are. Our body learns to fuction with less daily fluids and that's when the problems start....not right away but over time..So drink up !!! Check This Out .... W O W !!!!! Tips for a pain-free summer – from your ankles to your toes. 1. Choose your shoes wisely: While some footwear is designed for comfort and stability, let’s face it – a good deal of footwear is purely for show. Therefore, be smart with whatever type of shoe you choose. Flip-flops, for example, are a summertime favorite, but the experts at the American Podiatric Medical Association (APMA) have a few recommendations. Try not to wear flip-flops while walking long distances, since they lack substantial shock absorption and arch support. For women, the APMA discourages excessive use of high heels, since they can lead to a number of foot and ankle injuries. If you start feeling pain in the ball of your foot, those stilettos may be too high; try switching to heels less than two inches in height. Athletes also need to make sure their shoes fit well. Basketball players should have sneakers with high ankle construction that supports frequent changes in direction while tennis players’ shoes need lower side-to-side support to help with specific lateral movements. 2. Stop a sprained ankle in its tracks: The American Academy of Family Practice estimates that one million people in the U.S. seek medical attention for an acute ankle injury every year.The American Academy of Podiatric Sports Medicine(AAPSM)notes that ankle sprains are the most common of all athletic injuries. Violent twisting of the ankle can happen in all different scenarios, from football games to falling off a sidewalk curb. The AAPSM recommends rest, ice, compression and elevation (RICE) after the initial injury, followed by four to 12 weeks of gentle rehabilitation and strength building exercises. Most important, keep your feet away from any potential major stress such as athletics, if you want a full, quick recovery. 3. Massage, stretch and repeat: Whether you already have foot problems or not, regular stretching and massaging will greatly improve each foot’s ability to function properly and strongly. At the end of a long day, sit on your living room floor and place a small towel around the ball of your foot. Gently pull back until you feel the muscles start to stretch; make this an every day habit and you’ll probably be able to say goodbye to heel pain according to the APMA. Don’t want to pay big bucks for a professional massage? Give yourself the five-star treatment by putting a golf ball under your foot and rolling it back and forth while applying mild pressure. It’ll feel good immediately and in the long run. A good first step toward better foot health might involve a fieldtrip to your closet; throw out any old shoes that have lost their structure and cushioning, and eventually replace them with those that offer plenty of shock absorption and arch support. If you have a history of foot pain or problems, consider buying footwear marked with the APMA Seal of Acceptance or similar certification since they are scientifically designed for comfort and protection. For more information, visit the American Podiatric Medical Association at www.apma.org, and the American Academy of Podiatric Sports Medicine at www.aapsm.org. You may only need to cut a mere half a teaspoon of salt from your diet to see a benefit to your heart and brain. In a dramatic new study, researchers estimate that cutting out just three grams of salt a day (about half a teaspoon) could prevent up to 99,000 heart attacks and 66,000 strokes a year. So what's half a teaspoon? It's the amount most of us probably put in our pasta water. Still, it's unlikely that your pasta water is putting you over the limit. Research suggests we get up to 75 percent of our daily salt intake from processed foods and restaurant meals. In fact, processed and packaged foods have so much sodium that most of us end up eating 8 to 11 grams of salt a day; more than twice the recommended amount. Read all labels before preparing food so you know how much sodium you're starting with. Buy the low-sodium versions of prepackaged, frozen, canned, or jarred foods and sauces. Opt for fresh veggies over canned. Make things from scratch when you can, to control the sodium content. Rinse canned foods before using. Don't add salt to the water when you boil pasta or rice. Ditch the flavor packets that come with instant or prepared foods, and do your own seasoning. Choose fresh whole cuts of meat or fish over processed, pressed, cured, or canned. Choose fresh herbs and salt-free spices instead of salt. Try oil with red wine vinegar or lemon juice instead of salty salad dressings. Season lean meat and veggies with onions, mushrooms, peppers, and other fresh and savory flavors. Stuff fresh crunchy veggies into sandwiches or wraps instead of pickles or olives. So hide your salt shaker, read labels carefully, and choose whole, fresh foods whenever you can. Protection is the key to keeping that summer glow all winter long. On a cold winter day, there’s nothing better than turning up the thermostat and taking a nice hot shower. Or if you’re the type to embrace the snow, you might head outdoors for some skiing or ice-skating. Whether indoors or out, however, don’t forget about your skin. Winter weather can wreak havoc on your body’s largest organ, so stock up on some tips for keeping your skin in good health. 1. Become a moisturizing expert: According to the American Academy of Dermatology (AAD), ointments and creams tend to be more effective than lotions. It’s not necessary to spend a lot of money to get the best results. The best way to shop for effective skin care products is by ingredients, not price. Look for Hyaluronic acid, for example, which is already found naturally in your skin to help hold water, and simply diminishes with age. Lactic acid and urea are ingredients to look for to relieve dry skin. Glycerin, dimethicone and lanolin are other substances that can help skin attract and retain moisture. The AAD also recommends applying moisturizer within three minutes of exiting a shower or bath. Since moisturizer does not hydrate your skin, but rather locks in existing water, you need to prevent evaporation as quickly as possible. After the first application, you can re-apply throughout the day whenever necessary. 2. Beware of chemicals: Dermatologist Peter Helton, Medical Director of the Helton Skin and Laser Institute in Newport Beach, California reminds his patients to protect themselves from harsh, every day substances. Even if a bottle of home cleaner or solvent doesn’t recommend the use of gloves, covering your hands is a worthwhile step. Dish soaps, bleach, solvents and more can drain valuable oils and moisture from your skin, leaving you with red, cracked and flaky outer layers. Cleaning chemicals aren’t the only harsh substances to watch out for - many skin care products contain irritating fragrances, alcohol, deodorants, etc. Dr. Helton recommends sticking with gentle skin cleansers like Cetaphil®. 3. Hydrate from within: If you feel healthy on the inside, chances are you look healthy on the outside. To keep your skin from showing the effects of cold weather damage, take action from every angle. Board-certified Dermatologist Lisa Benest swears by walnuts, canola oil and ground flaxseeds, as well as Vitamin E goodies like green leafy vegetables for healthy skin. Dr. Benest also notes that eight glasses of water per day is crucial, and avoiding caffeine may be necessary if you’re prone to extremely dry skin. If your skin just won’t stop cracking, itching or even bleeding, talk to your doctor. While special prescription treatment may be necessary, basic at-home skin care can greatly improve the health of this complex organ. Winter or summer, sunscreen is a must to help keep skin youthful and prevent skin cancer. Don’t forget your lips, even when it’s cold. A Sun Protection Factor (SPF) of 30 or greater is recommended. Want more skin tips from the American Academy of Dermatology? Visit www.skincarephysicians.com/agingskinnet/winter_skin.html and www.aad.org. For more advice from Dr. Peter Helton, see www.drhelton.com/pages/winterskincaretips.html. Dr. Lisa Benest is currently the National Skin Care Institute’s featured dermatologist. Learn more at www.skincarenet.org. Summertime Health Tips Get some sunshine each day so your body can manufacture Vitamin D which, along with calcium, has been found to prevent skin and other types of cancer. Just don't over do the sun OK ! Drink at least 8 glasses of fluids each day to prevent dehydration.. Stay away from dairy products and foods containing dairy products on very hot days. Who needs to be nauseous ? Make daily contact with seniors who live alone to make sure the heat didn’t get to them and they’re alright. Turn your house AC up to 80 + when you leave in the morning for work. It’ll only take 15 minutes to cool down the house when you come home from work (plus you’ll save a bundle in $$)……………In the Summertime, we tend to do more walking than usual. Put some gel cushions inside your shoes for comfort and to prevent blisters. Wear loose clothing or clothing that doesn't cling. Monitor your salt intake as you tend to sweat more in heat and you don't want to exhaust your electrolytes. Sneakers and sweat socks are comfortable to walk in but don't forget that they trap a lot of heat. You may be better off with a comfortable walking sandal. For pet owners, remember to leave your house ventilated and fresh water available daily. Be cautious about buying foods and refreshments from street vendors, as the likelihood of bacteria and other nasties is high. Vitamin D has proved to be a crucial nutrient for helping the body defend against cancer and heart disease, fight off the flu, and keep bones strong. But the body’s supply of this often bottoms out in most people, according to researchers at the University of California Irvine (UCI) and the Mayo Clinic. That can lead to serious health consequences. The most important source of vitamin D is the sun: Your skin makes vitamin D from its ultraviolet B rays. In summer, during August, most people’s vitamin D reaches its peak. But as the sun disappears in winter, vitamin D levels slip downward, reaching their lowest point in February. The study looked at population averages, so your vitamin D level may vary in a different matter. Still, February might be a good time to have your blood level checked and take vitamin D supplements if necessary. 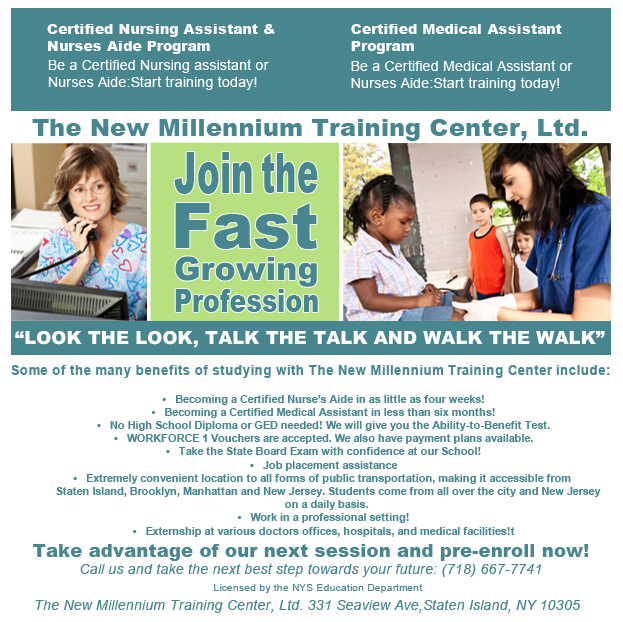 The New Millennium Training Center gets calls weekly from facilities asking us not to forget about them and to please send them CMA's and CNA’s because they have openings..,. We won’t forget about you and we do send them to everyone who asks. We always extend our extreme thanks to HRA, Workforce 1, VESID, Project Hospitality, Seamen's Society, Jewish Board Of Family Services, Catholic Charities, 911 Fund, local synagogues and churches and other community resources who have helped so many people gain employment through professional training to prepare them for second and third careers. We would like to say hello to all of our past students who have stopped in during classes and have spoken with the classes about their own recent job experiences. Our picture gallery keeps growing with hundreds of students each year and the testimonial page on our pictorial section of our website, is getting pretty well filled. 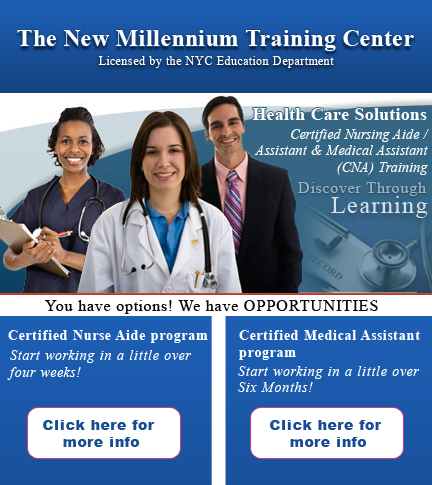 Many experienced Medical Assistants in NYC are earning substantial incomes!! ( Its legally necessary to have credentialed personnel in a doctor's practice, especially if they are hands on with patients). Better to pay them and keep the money in the MD's practice , than for the MD to pay it out in taxes or heaven's forbid a law suit!! Promotional Items have been a welcomed surprise to so many students. Our new school tee shirts, given to students during warm weather, have been a huge success and tee shirt Fridays have been great fun to keep our fun spirits up. The new school bags that each student receives as well, have really made a difference to our students who had a difficult time keeping all of their papers together. Personally, I'm really fond of the CNA and CMA pins that I give each student when they complete the classes. Our latest addition to our promotional items are our school pens that are distinctly The New Millennium. We are proud to announce that our "advertising bench " which is 8 feet long can be seen and sat on directly across from the Pharmacy Department, at the SHOPRITE Supermarket, located on Hylan Blvd which is visited by 48,000 customers per week. Students who are interested in enrolling into our Full Medical Assistant Program, may want to consider taking out a Personal Training Loan. The New Millennium Training Center has recieved candidacy status for National Accreditation and Official recognition from the United States Education Department. This will soon put our school on par with many of the largely recognized schools across the country. Other News.....The New Millennium Training Center is redesigning our website as too many people told me its time...so I listened. Our school has once again inaugurated my favorite form of advertising....grass roots marketing. Hundreds of students have been diligently passing out very tastefully designed 4” x 6” marketing cards all over Staten Island. They are being left (with the owner's permission) in delis, bagel stores, coffee shops, bowling alleys, nail salons, supermarkets, etc... Thanks to all of our loyal alumni. ….Our TV COMMERCIAL has had alot of people calling and mentioning that they saw it..Thanks !! I was honored to sing The National Anthem at Staten Island Yankee Stadium last season.. and thank you to everyone who comes to my shows around Staten Island. I'll keep singing if you keep coming ..alright ? I've was invited back to sing The National Anthem at Staten Island Yankee Stadium this summer and may also do CIty Field for The METS...Hope you were able to make it. Its a big thrill for me and great fun for everyone.
" They hired me from The New Millennium Training Center right away. It was a 1,2,3, process...I trained, tested and got hired! " 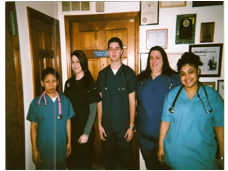 " Some of us went on after CNA training and became Medical Assistants. " wearing my uniform and stethescope and actually doing nursing skills. " EKG's and now can get a respectable position from coast to coast! "